This is the fourth episode in Molly and Sara’s new podcast series Living Fearlessly. Each week, they will dive deeper into the things that we can all do to live fearlessly for ourselves and our soul growth. 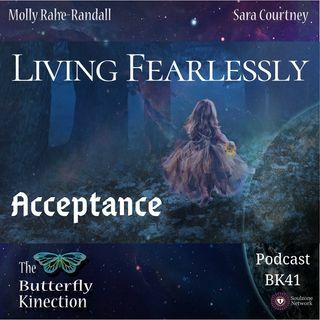 This week, Molly and Sara's topic is Living Fearlessly-Acceptance. They talk about accepting others for where they are at so we can begin to find the courage and strength to move forward and accept ourselves. Molly and Sara discuss how easily our focus can be shifted to what others are ... See More doing when we are not wanting to face what we are not doing for ourselves. People reflect back what we wish we were taking the time to do. We need to see others for where they are at and accept and support them along their journey. Then we can begin to focus on accepting ourselves. Jealousy, frustration, and judgement of others can get in the way of accepting others and ourselves for where we are at. We must remember that we all make decisions to move forward in our own time and in our own way. There are certain things that need to happen in our lives so that we can make decisions to move forward. No one person knows the end result of their life or anyone else’s life. The growth is in the lessons, not the victory. People are placed in certain points in our lives for growth. Those experiences with others help us to learn lessons so we can decide whether we would like to grow or not. Molly and Sara pose many questions about acceptance. If we forgive ourselves for where we are at and don’t get hung up on the past and what we wish we did, we can then take the steps to accept ourselves in this moment. Once we do that, we can be ready to look forward. Accepting change and letting go of control are scary things. But embracing the change and releasing the control can help us to accept others and ourselves so we can live fearlessly. To receive information on special offers, new products, upcoming podcasts, new classes, or our newsletter, subscribe to our email list go to https://landing.mailerlite.com/webforms/landing/e0j7i3. Look for Soul Reflections Academy (https://soulreflectionsacademy.teachable.com) on our website and sign up for our Free Soul Reflection Challenge at https://soulreflectionsacademy.teachable.com/p/soul-reflection-challenge-tbk .